On May the Fourth, you turned two years and six months old. Also, happy Star Wars day! (May the Fourth/Force Be With You.) 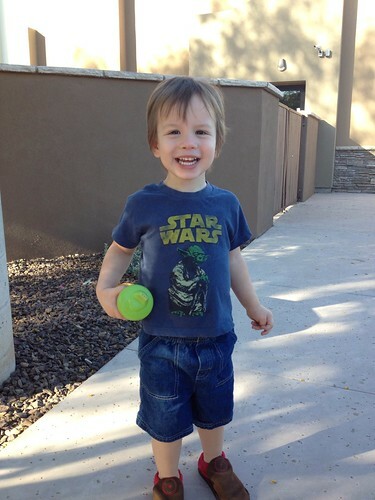 I dressed you in a Yoda shirt, since you are a little young to have a say in the matter. It’s been a busy past two months for you. You’ve greatly improved all your animals sounds, and enjoy playing that game more than ever. You can also recite the entire alphabet. For a while, you could do pretty much all of it, except when we got to “L” you would emphatically insist that the next letter is “P” completely ignoring the letters M,N,&O. You also sometimes skip J and V, but most of the time, you’ve got it down. You have come SO FAR with transition points. You still often cry at drop off, but your behavior when we take you out has improved dramatically. I’m not exactly sure what changed, only that you’ve started to follow directions a little better and not freak out when we go out. Eating out improved first, and now when we go out, you might fidget or want to be entertained, but you don’t start crying and having a fit anymore. And the last week or two, you’ve even been okay with me putting you in a cart when we go shopping! It’s been so wonderful, and I’m so proud of you. At risk for Autism really through me for a loop, but the more we work with you, the less I think that Autism could even be an issue. Both your speech therapist (Vicki) and your DSI (Lorraine) feel that you are doing great, and that if you are autistic, that you are very high functioning. I don’t think you have Autism, based on all of my research and your rapid improvements since we had the tubes put in your ears. All and all, it doesn’t matter too much what they label you with, because you are awesome, just the way you are. Based on Dr.J’s assessment, we have added an OT (Stephanie), who has now been out to see you twice. She is very nice, but the two of you are still getting the feel for each other. This means you are up to three therapies a week. You’re making strides towards Potty training. You stay dry most of the day at school, which is awesome. You are hit and miss at home, but we’re still working on it. You do seem to like going peepee in the potty, and you enjoy the candy you get when you go. Hopefully we can get you trained before you turn three. That would be amazing. In March, we took a Cabin trip and went hiking. At the time, you were still not doing good around transition points, and did not enjoy the hiking. Despite the fact that you love to run everywhere, you did not want to run on the hikes, but instead wanted to be carried. Other than that, you had a good time though. The first night we were there, it was very cold. You woke up in the night freezing, because you always kick your blankets off! I got up and touched your skin, felt how freezing you were, and put you into bed between your father and I to warm you up. You (unlike your older brother) immediately cuddled down and went back to sleep without issue or kicking. You are engaging in pretend play more and more! My personal favorite is the relatively new Phone game. You put the flat of your hand against your ear and face, and then say “HELLOW” I mimic you with the hand gesture and a “Hello! How are you?” You respond “I’m good BYE!” and put your hand down. For Easter this year we went to the AJ Egg hunt again. You did rather well, collecting a couple of eggs and not freaking out at a new place with new people. For Easter you got a board book with pictures of yourself and our family going on adventures, which you really seem to enjoy reading. At night when we put you to sleep, you tell us “Night Night!” But then you stay up and play with your toys. We let you get away with your little rebellion, because it makes you happy and you are relatively quiet. You are slowly adding more phrases to your vocabulary. You tell me “TV on?” or “Turn it on!” and point at the TV. You’ve started telling specific people hello and goodbye, as in “Hello Dada!” and “Bye Bye Landon!” This morning you told your Dada to “Have a good day!” The two word combos you do on your own make me so happy. You are growing every day. I’m really proud of how far you have come. I have a lot of faith in you. I know you will continue to grow, and that you are absolutely amazing. I love you very much.